From former UN Secretary-General Kofi Annan - our quote of the day. ‘Non-transparent business practices’ were failing Africa and its people, he said last night, with secrecy over company ownership giving rise to the question: ‘how do we know it is honest?’ In contrast, transparency was ‘a powerful tool’ to build peaceful, prosperous and stable countries. 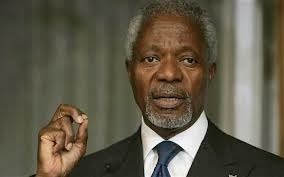 ‘The G8 and G20 have shown a commitment to clamp down on tax avoidance and evasion,’ said Mr Annan. ‘Such avoidance or evasion is not only unjust; it enables vast illegal or unfair outflows of revenues from extraction industries in developing countries. ‘Several countries are taking steps to pull back the veil of secrecy surrounding control and beneficial ownership of companies. The United Kingdom set a forceful example when it in October announced that it would make its registry of companies fully open to the public. ‘Such an action could, in one dramatic sweep, end the extensive web of secret corporate structures to hide illicit and unjust earnings. But it can only work properly once a critical mass of countries act in unison,’ said Mr Annan last night."